These days we get an amazing variety of ready to eat frozen food which is a boon for working women and bachelors. Sumeru is one such company which has a large variety of both veg and non veg frozen food. You can easily get them in any supermarket. 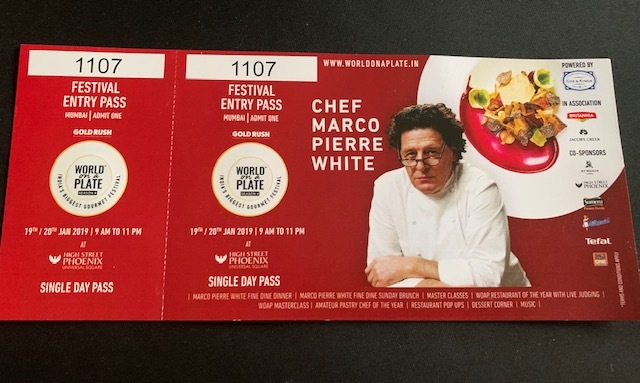 Few days back they sent me a complimentary gift hamper of vegetarian products along with an invite to attend the gala event "World On A Plate" (Season 4) in Mumbai. 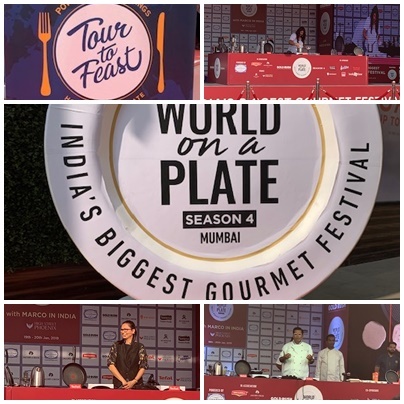 It was a fun-filled day tasting delicious food, meeting famous chefs and watching them create innovative dishes. I must thank Sumeru for giving me this opportunity. Sumeru was also one of the sponsors of this event. I visited their stall too and had a look at all the products they have. I am definitely going to try out the non-veg stuff too. 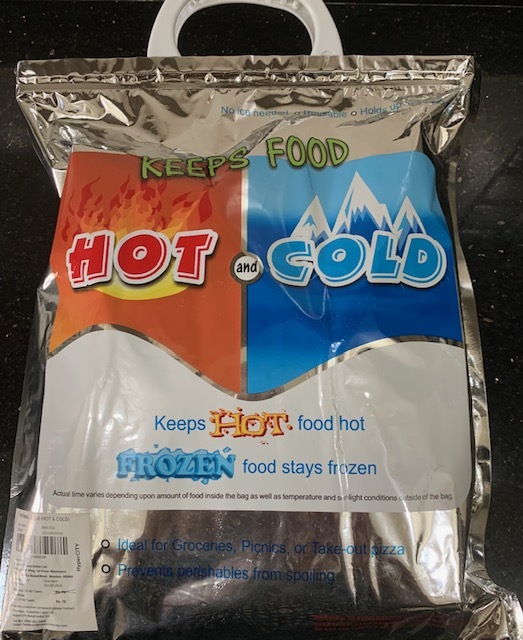 Coming back to the gift hamper I was really impressed when the frozen products were delivered in a re-usable thermal bag which keeps the food hot and cold. 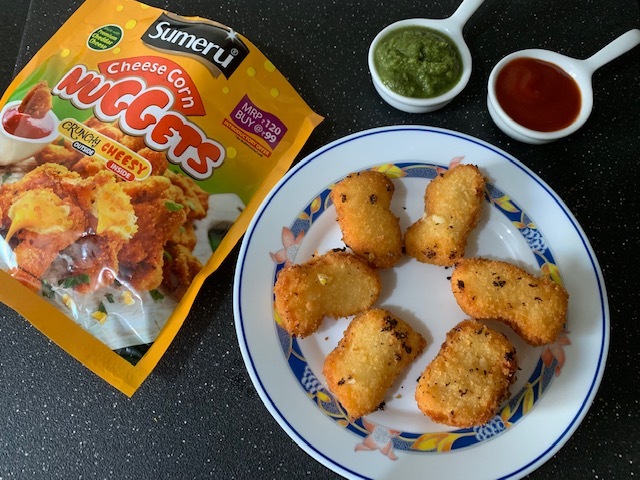 The hamper contained Cheese Pops, Cheesy Corn Nuggets, Super Millet Khichdi and a packet of Grated Coconut that can be used in cooking / making chutney. Our family really enjoyed all of them. I am sharing the pictures below. 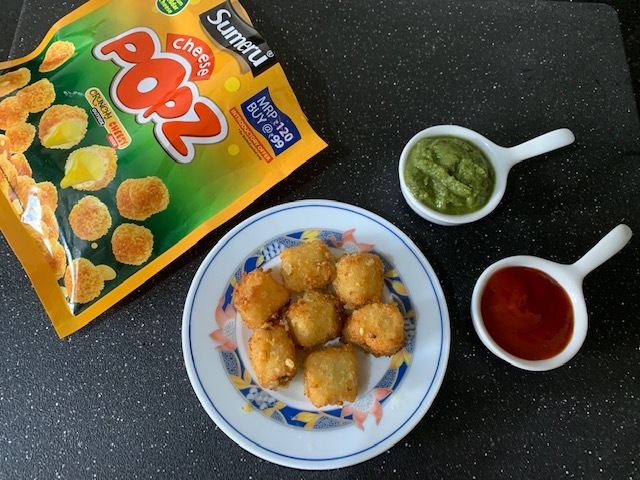 The pops and nuggets were nice and cheesy.. Kids will surely love them. 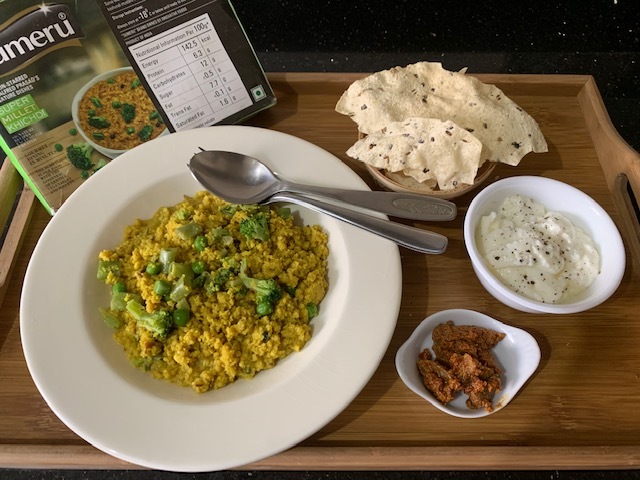 The millet khichdi was nice and healthy option. It was a single portion packed in a microwavable container.You can relish it with pickle, curd and papad. 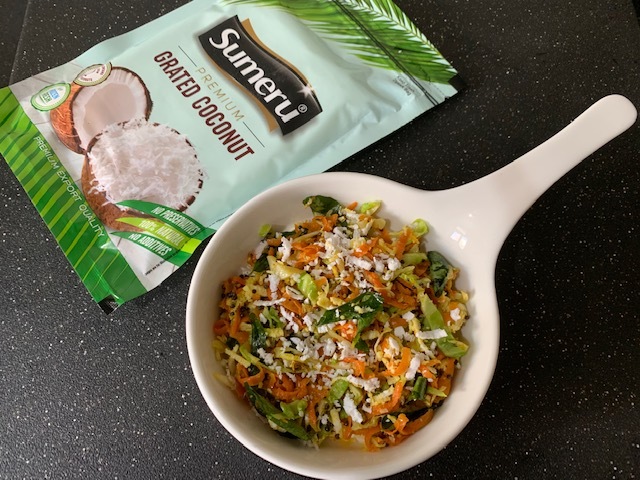 I used the grated coconut in a healthy cabbage and carrot stir-fry. You can have it by itself or serve as a side dish. 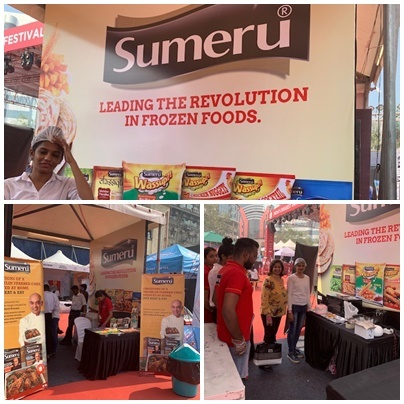 Once again I thank Sumeru for the exciting day at the event and the delicious goodies. PS: I was sent these items for tasting. I was not paid or asked to write a positive review of them. Frozen coconut looks like it would be a true asset in the freezer!! Yes Heidi.. I use it a lot in my cooking. Looks like my kind of a Day going to a food realted event. 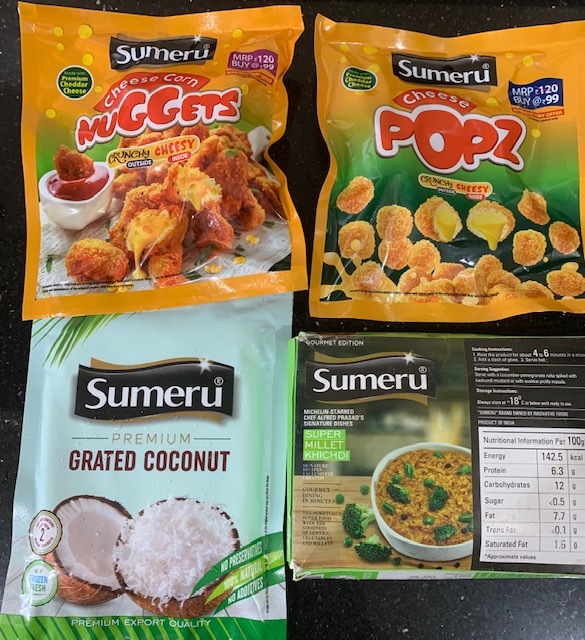 It's great to have some ready frozen food available in the freezer for when we haven't got time to cook from scratch. I am amazed at the variety available now. Yes Mina.. there is a large variety of frozen stuff available in India now..and the event was so much fun meeting my favourite chefs. I always keep frozen veg in my freezer as sometimes I can't get to the Indian shop for purchasing veg in Uk. The frozen veg come very handy. Yes, I used to do the same when I was living abroad.. Here in India we get everything easily in the vicinity and also home delivery from the grocery stores.